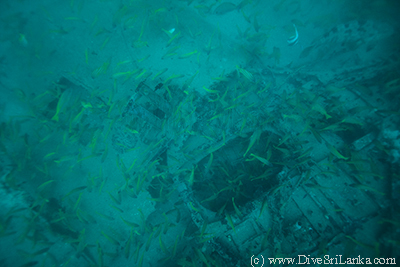 21/09/2014: Amidst a strong current I am descending down the anchor line towards the unknown. 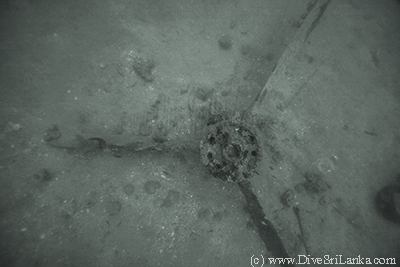 Moments earlier a sonar echo scan had indicated the presence of some subterranean object 42m below. 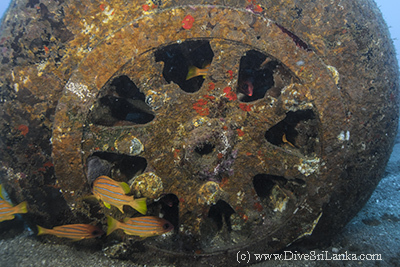 Many a time these explorations have ended up with finding a rocky reef, of course sometimes with excellent marine life around it. With little expectations I continue the descent down when suddenly at 38 meters I see a shadowy form with an unnaturally straight line. Nature rarely produces straight lines. I leave the anchor line and swim frantically against the strong current towards the shadowy foam. It is the wing of an aircraft. 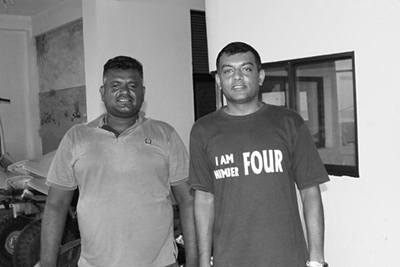 I am here because in 2013, a fisherman in the east coast of Sri Lanka, Wasantha Kumara from Kalkudah, had discovered a strange piece of metal wreckage when he pulled up his fishing nets. He suspected that it could be a part of an air craft fuselage. 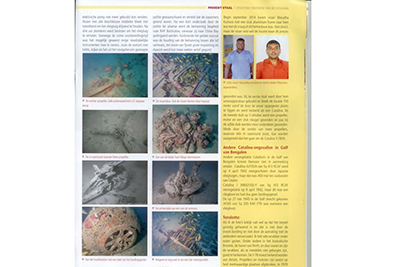 After establishing contact with Wasantha who indicated location where he found the wreckage, I conducted a sonar search. 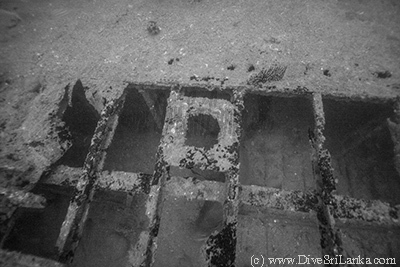 After an hour of echo scanning the sea bed and finding nothing of interest, I had almost given up and the boat was drifting idle in the currents when suddenly the visual display of the sonar started spiking. 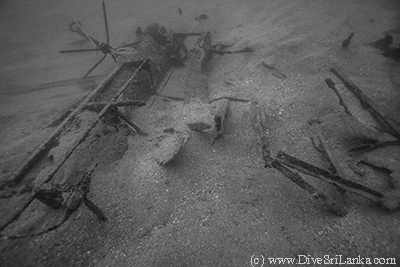 Right below me was something on the sea bed.. 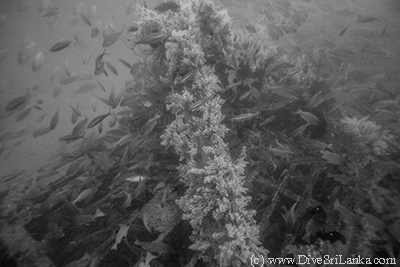 Thinking it was a rocky reef, I was relatively unexcited and threw anchor. After a while it hooked and the boat held position. 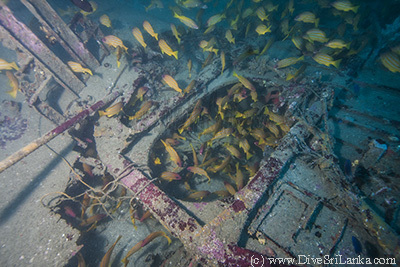 The depth here was 42m and fortunately I was prepared for a Tec Dive with three tanks. I quickly don up and dive. It is an air craft indeed. Wasantha had been right! This is one side of wing. One long wing perhaps about 12m long. 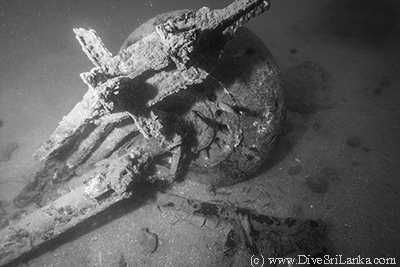 I swim the length of the wing and in the vicinity soon discover a debris field consisting of a large wheel and parts of undercarriage. To the left of it is a piece of what looks like a part of an engine. Then a propeller! Further away to the right another wheel! 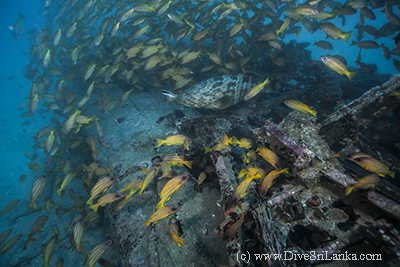 The dive site is full of Blue Striped Snappers. It is difficult to study the features of the wing because of the profusion of fish. Two large groupers study me intently. Unlike other sites, they are not afraid of me. It could be that this is the first time they are seeing a human being. One of them is larger than the other and in subsequent dives they are always there to greet me. At first I immediately think that this is one of the Japanese VAL bombers shot down by the valiant gunner of the British Sergeant who was at his post until the very end. 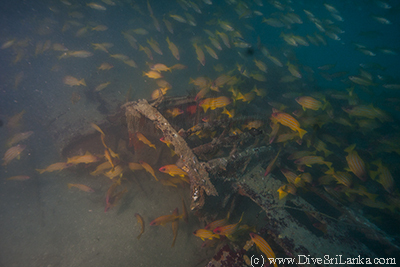 The wreck of the British Sergeant lies about 15KM to the north. That seems a long distance, but how could there be any other plane? 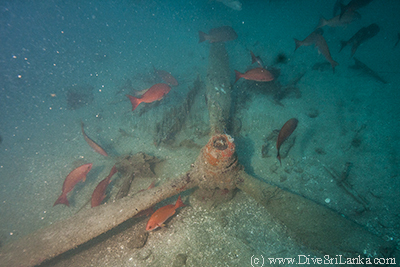 In my next dive I find another propeller and engine nearby. This confirms that the crash site is of a plane with twin engines. VAL's, Kate's and Zero's were single engine aircraft. For weeks I poured over aircraft crash records including losses from 1960's. 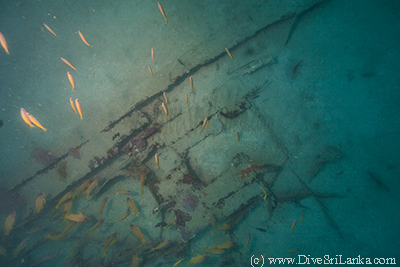 None of the air craft types matched the features of the wreck. Frustrated, I post pictures on Facebook seeking help. It pays off. 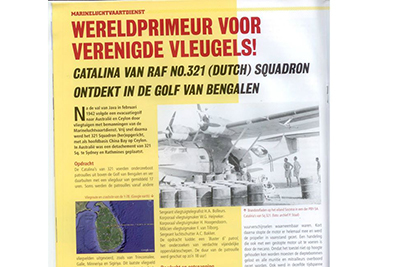 One of the people who sees my post suggests that it could be a Catalina. And suddenly everything falls into place. 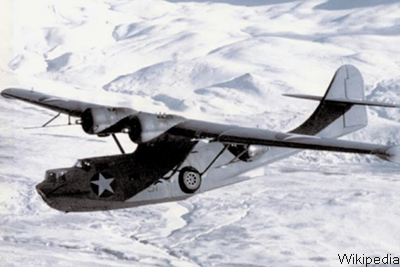 Amazingly every feature is accounted for and matches the Consolidated Catalina PBY-5A model. 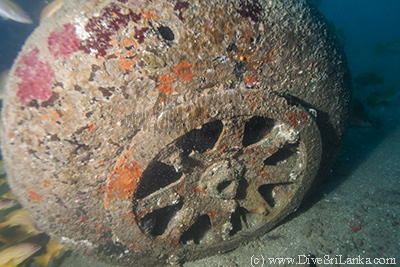 These features include the wheels, details on the propeller hub, the engine type, what seems to be the engineers window and a structure beneath the wing. This structure turns out to be the Catalina's Metric Wave Radar with Dipole Antennas. In fact the Catalina was one of the first US aircraft to carry these types of Radar. 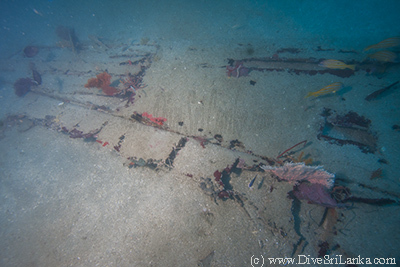 Further research reveals that a PBY-5A from a World War II Dutch RAF Squadron crashed exactly in the location where the Catalina crash site is. It had been on a night mission on the 9th of December 1943, when an engine failure caused it to abort the mission 1.5 hours into the flight and crash land into the sea. 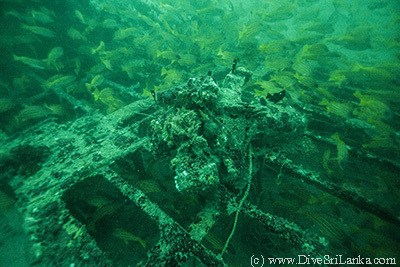 All of the 11 crew survived in one of the dinghies they managed to salvage from the plane before it sank within an hour. The survivors reached shore 80KM from the China Bay Airforce base where they were based. The line of sight distance from China bay to the crash site is about 85KM. Investigations continues. Also watch our video documentary on this find. Prop 1 - (A key piece of evidence that matched with the crash report. Prop 2 in normal position as opposed to Prop 1 set to "feathered"